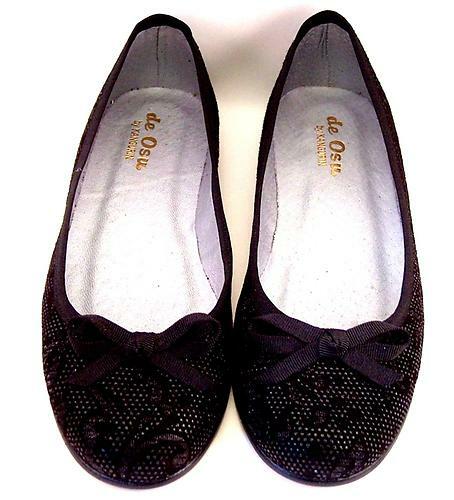 Classic ballet flats in premium black suede with black patent tapestry pattern (not lacey holes). Handcrafted in Spain using top quality components. Full leather breathable lining in soft silver with cushioned insole. Internal "counters" for support and good wear. Leather-substitute sole with slip resistant finish. Euro 35/US 4 = 8 3/4"
Euro 36/US 5 = 9"
Euro 37/US 6 = 9 1/4"
Euro 38/US 7 = 9 1/2"
Euro 39/US 8 = 9 3/4"
Euro 40/US 9 = 10"
Euro 41/US 9.5 = 10 1/4"
Euro 42/US 10 = 10 1/2"